Slab apricots are harvested when they are fully ripe. 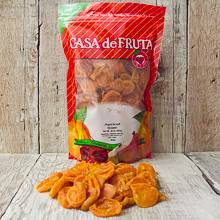 They are sweet, juicy and so soft that they don't hold their shape when cut into halves and dried. If you haven't seen many slab apricots, it's probably because the farmers save most of these for themselves. Fortunately for you, we just can't eat them all! Packaged in a 32 oz. bag.